The layout in this pis yabit consists mainly of a center square, 4 squares at the corners, and smaller squares which occupy a rectangular region at each side. A motif appearing in each square has a vertical reflection, a horizontal reflection, two reflections about diagonal lines and a 90o rotation at the center. The symmetry group is D4. Observe that the center square splits into 18 rectangular sections exhibiting two distinct motifs. A motif in a given rectangle also has a vertical reflection and a horizontal reflection, but this time there is a 180o rotation about the center. The symmetry group is D2. Strip patterns of blue and white with only translational symmetries surround the center square. The symmetry group is 11. 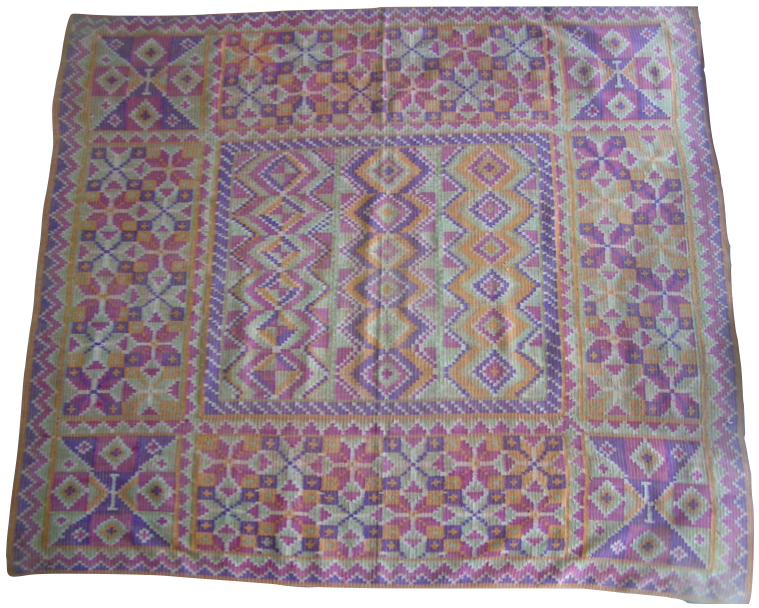 There are also two types of strip patterns consisting of zigzag designs with vertical reflectional symmetries, 180 rotations and a glide reflection that appear at the borders of the pisyabit, and around the squares and rectangles. The symmetry group is mg.